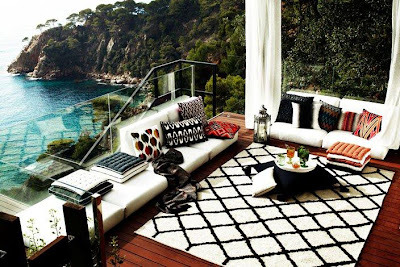 Someday I hope to have a home near the water with an outdoor deck like this for entertaining and relaxing! While the backdrop of this photo makes it easy for any decor to look good against, it was interesting to me that it was all very simple. A cool rug and some colorful throw pillows set against a basic white sofa and the natural landscape were all that was needed to make this space look comfortable yet chic. Essentially it is the same within fashion, amazing accessories set against basic neutrals always make for an interesting outfit!